TEHRAN: With its currency plummeting ahead of the reimposition of US sanctions, Iran has responded with dozens of arrests and claims of an enemy conspiracy, but also signs of a push to confront corruption. 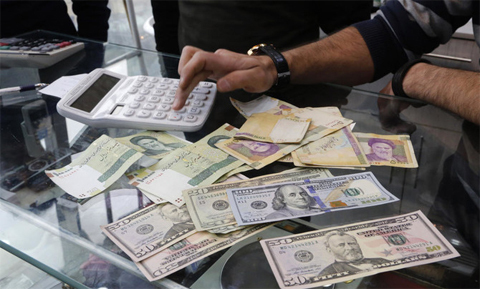 The Iranian rial has lost almost two-thirds of its value since the start of the year, and 20 percent in just two days since the weekend, hitting a record-low of 119,000 to the dollar. Many lay the blame on the imminent reimposition of US sanctions on August 6 following US President Donald Trump’s decision to pull out of the historic nuclear accord, with Iranians rushing to store their savings in dollars. The central bank issued a statement on Monday that trod a familiar line, blaming “the enemies’ conspiracies” for the rial’s sudden decline. This may not be purely paranoid fantasy. The US and its Gulf Arab allies are engaged in a “maximum pressure campaign” against the Iranian government, and there have been rumors that the United Arab Emirates has been curbing the physical supply of dollars to Iran, helping drive up prices. But others say outside pressure is only effective because Iran’s economy is so corrupt and poorly managed. Belatedly, the authorities appear to be waking up to the crisis. This weekend, the judiciary announced 60 people had been arrested for fraud and trying to undermine the banking system, with more to come. Spokesman Gholam Hossein Mohseni-Ejeie said several had direct ties to the government, allowing them, for example, to illegally import luxury cars, and could face the death penalty on Iran’s infamous charge of “corruption on Earth”. The arrests follow mounting anger against profiteers who use political connections to access dollars at artificially low rates, and then use them to import goods on the cheap, or simply sell them on the black market for a huge profit. In a radical departure from usual government practice, in June the young telecoms minister Mohammad Javad Azari Jahromi exposed a group of mobile phone importers who were gaming the system. They had been granted $250 million at the cheap rate to import phones, he said, “but less than one third was used for the purpose”, implying the rest was stashed away or sold. The other priority is fixing the chaotic policies that have facilitated profiteering in the first place, particularly the disastrous decision in April to set a single, fixed rate for the dollar at 42,000 rials. To enforce the decision, the authorities shut down currency trading shops and made it illegal to sell dollars above the official rate, which only fuelled a boom in the black market. The government was forced to climb down in June, saying only importers of essential items such as medicines would use the cheap rate, while others would negotiate a higher price. President Hassan Rouhani sacked the central bank chief last week, and his replacement, Abdolnassar Hemati, has promised new currency policies “in the coming days”. But trapped in fire-fighting mode and under fire from both conservatives and reformists over the deteriorating economic situation, Rouhani has done little to address deeper problems. “We’re in a full-fledged crisis and that’s taking all the attention. No one is talking about bank reform and investment and job creation,” said economic journalist Maziar Motamedi of Tehran’s Financial Tribune.